I remember when I was really young, my dad used to go to the gym and he used to wear Goldstar brand shoes. It was a brand which was made in Nepal and it has reputation for lasting long. But since I have come to Australia, I haven’t seen the brand much until recently. First I saw the comeback of the shoes in my Facebook with Nepali celebrities wearing them. It has changed completely from what I remember; from traditional dark conservative style to new modern colourful shoes. I read that now Goldstar exports premium quality shoes to India and other countries at an affordable price. It is also available online and via Facebook and Instagram. One of my friends was getting a few pairs of Goldstar shoe for himself and his wife so I decided that I would get a pair as well. Finally it has arrived here and I love it. I love the colour and style. The finishing could still be better for competition in international market but it is still a great product starting from Rs 500 (AUD8). How can one go wrong with that price? It is really comfortable and I hope it will last long. If you are going to Nepal do check different range of Goldstar. I am sure you will find your style from their huge range and support a product made in Nepal. 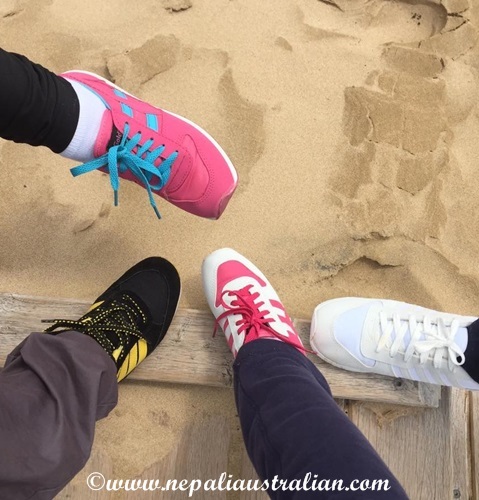 This entry was posted in Nepal and tagged australian, australian nepali, goldstar, grandparents, M from nepaliaustralian, made in nepal, money, Nepal, Nepalese, Nepali, nepali australian, Nepali blog, Nepaliaustralian, shoes. Bookmark the permalink. I remember goldstar being the cheap yet good looking shoes. It was manufactured somewhere between birgunj and parwanipur. It is still good shoes. I love mine. lovely post. A truly classic Goldstar. hlo…. dats gret to hear abt goldstar.. can u give more details abt goldstar… or wud u nt mind sending me links of company so dat i can get more details on it…. The only one I know is in Instagram, try https://www.instagram.com/madein.nepal/. Hope it helps. Oh how interesting. I only knew Goldstar as a electronic company and then also for building tractors (my neighbour had one) but that one was a Korean Company. We had Goldstar TV in Nepal too 🙂 . Ohh cool! 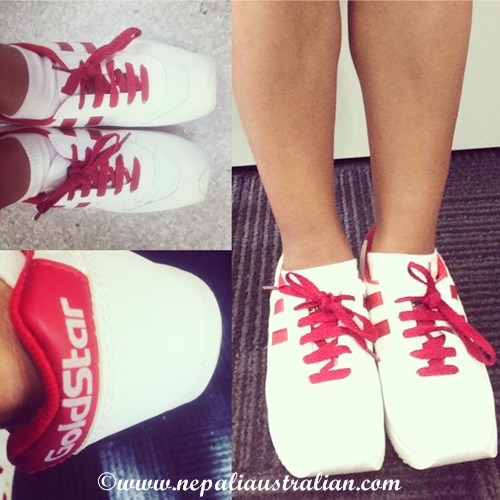 I didn’t know about that at all 🙂 Goldstar – possibly the most famous Nepali shoe brand among Nepalese hehe. I hope they do as they have so much variety these days.